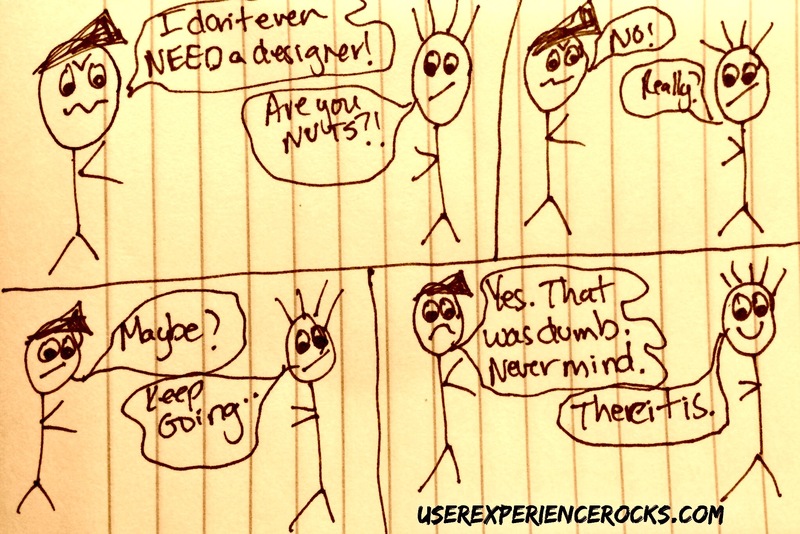 Recently there has been some discussion around how app design can hurt app development. It’s kind of blowing my mind. A app that isn’t designed by folks who have conducted research and understand their audience is typically doomed to fail. Developers are amazing at what they do. And they are passionate about what they do. And there are even some killer devs who are also killer designers. But most of the developers I know HATE the design phase, and are happy to have designers on the team to handle that aspect. Creating prototypes and checking in with the dev team throughout the process is key to creating mobile apps in an agile environment. If your dev team doesn’t see, or give feedback on an app until the prototype has already been through the usability testing phase, then of course you’re going to have a train wreck on your hands. That’s not a designer or a developer issue, thats a serious workflow issue that needs to be corrected. In order to create a solid app, you need an outstanding communication and feedback loop. One tool that makes this pretty seamless is InVisionApp. Both my dev friends and my designer friends love it, because they can give feedback in a matter of seconds without having meetings about meetings all day long. The designers finish a couple screens, shoot the devs a link, the devs reply back with any technical limitations that could get in the way and then the designers iterate. The process loops until they have an amazing technically plausible prototype to test with users. Layer consistant Slack communication on top to clarify details, and you’ve got a beautiful, agile, functional workflow on your hands. The best part is that this process flow works for huge teams as well as teams of 2. Please, please, don’t try to jump on the designer-less app bandwagon… You’re going to fall off the other side and crush your app’s potential in the process. Part of me can make a really rational argument. That part of me knows that some of these people have also worked with bad designers that have NOT helped them figure this out. Another part of me is shocked we have to make this argument at all in 2015. I totally agree with every single thing you just said! haha Total waste of cash too, having to recode everything when a quick prototype based usability test could have identified the issues in seconds.